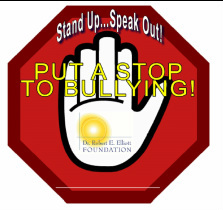 The Dr. Robert E. Elliott Foundation is committed to providing training and resources on bullying prevention in our community. Our goal is to take educational programs to the schools of White County so that our children can learn and live in a safe environment. For more information on our programs, please contact us at 501.278.4357 or email us at drrelliottfdn@hotmail.com. Thank you to First Security Bank for helping us spread our message about our anti-bullying efforts. First Security accepted donations from the public to display the "Put a Stop to Bullying" signs in all their branches. Money raised will be used to purchase books and materials for local schools. The Elliott Foundation has purchased "Let's Put and End to Bullying" workbooks to distribute to local elementary schools as a part of our anti-bullying initiative. For more information on this program and on how to get these workbooks into your school, please call 501.278.4357 or email drrelliottfdn@hotmail.com. 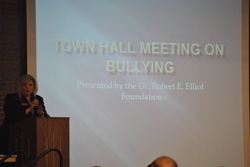 The Elliott Foundation was proud to host a Town Hall Meeting on Bullying on Monday, November 4th in the cafeteria of Searcy High School. Members of the community, school administrations, law enforcement and students were invited to attend the event, which provided valuable information on bullying and cyberbullying. Dr. Jeffrey Palmer adn Joshua Carroll presented the program which included, looking for signs of depression, proactive approaches for prevention and ways to be your child's advocate. Thank you to the White County Community Foundation for their sponsorship of this event and for Think Advertising for being a community partner.